Tesla, the most shorted stock in the US, skyrocketed on Wednesday following the carmaker’s annual meeting. That surge cost short sellers more than $US1 billion as the stock rose nearly 10%. Tesla‘s recent slump has been a boon for investors betting against the stock – but Wednesday’s surge cost them more than $US1 billion. 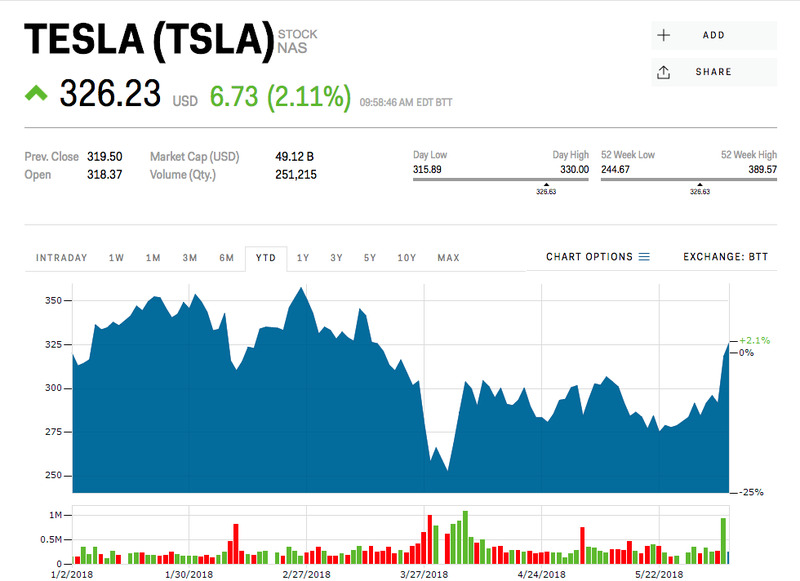 Following CEO Elon Musk’s announcement that the company should meet its Model 3 production goal of 5,000 cars per week this month (as well as a handful of other updates at the annual meeting), Tesla’s stock price spiked 9.74% on Wednesday. That generated a cool $US1.1 billion in mark-to-market losses for short sellers, according to data from financial analytics firm S3 Partners. “Today’s 37.7 million shares shorted and $US11.0 billion in short interest will probably decline as short sellers cut their positions even further after incurring $US1.1 billion in mark-to-market losses,” Ihor Dusaniwsky, managing director of predictive analytics at S3, said in an email. Ahead of Wednesday’s surge, short sellers had netted a $US572 million profit in the first five months of the year, S3 said. But the firm also warned that’s not likely to continue due to Tesla’s prominence as the most shorted US equity. Shares of Tesla are down about 1% this year.